Nothing like a little trip out of the country to check out one of my favorite things. You guessed it, cocoa. 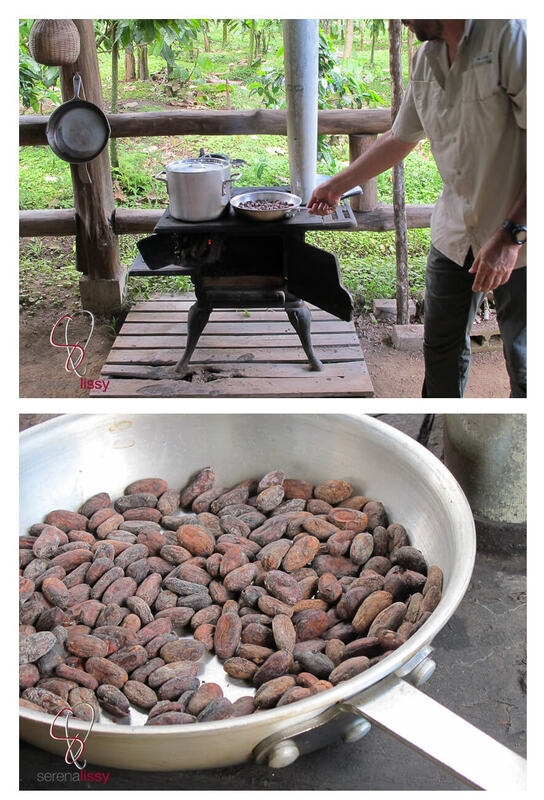 If you have never been to a cocoa farm and you have the opportunity to go, I would highly recommend it. 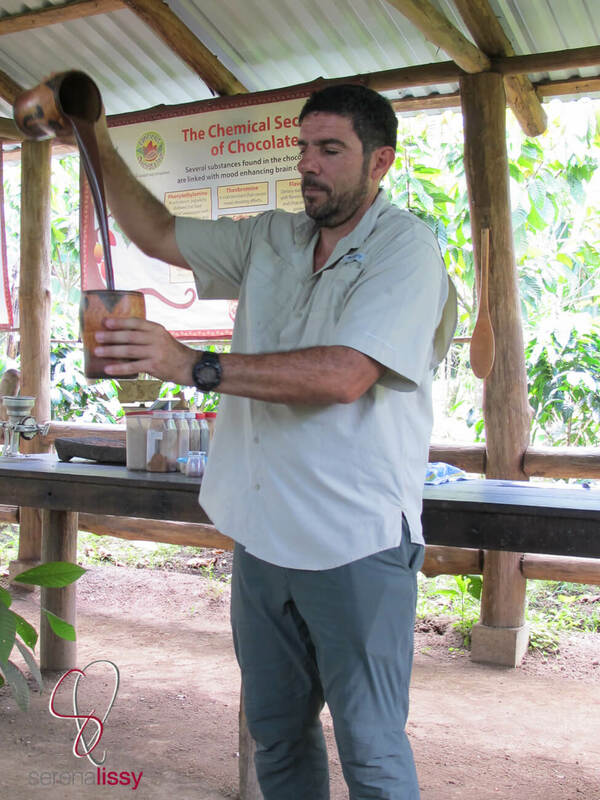 While planning for a Costa Rica trip, I knew that a cocoa tour was something that I had wanted to do. The challenging part was finding a farm that worked with the trip schedule. I spent 10 days in Costa Rica, but in a different city almost each day. And after a few experiences of no success with reaching the local vendors, I must say I was a bit doubtful that I would actually make it to the cocoa farm. But luck was on my side this day, as I pulled into the parking lot with minutes to spare. If you have ever been to Costa Rica, you know the roads are pretty much dirt, windy, and full of huge potholes. So something that should take 30 minutes to get to turns into a three hour experience as you celebrate each missed pot hole. 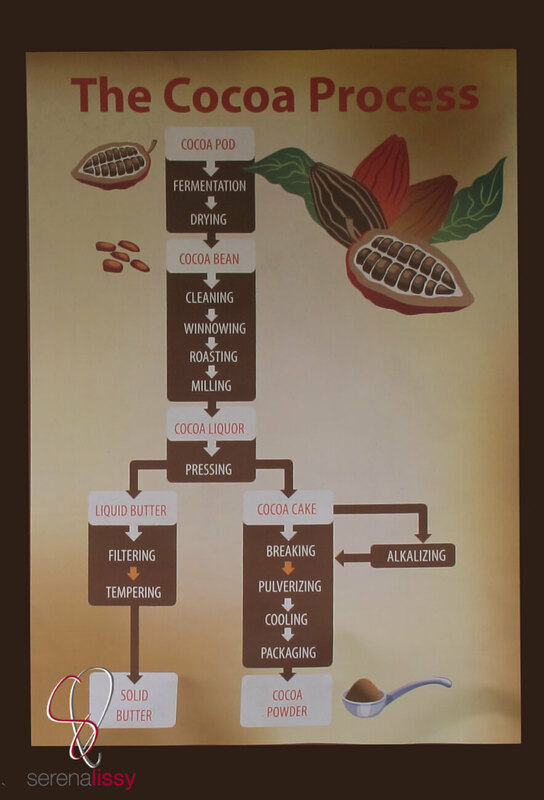 You can see from the image the small flowchart of the cocoa process. 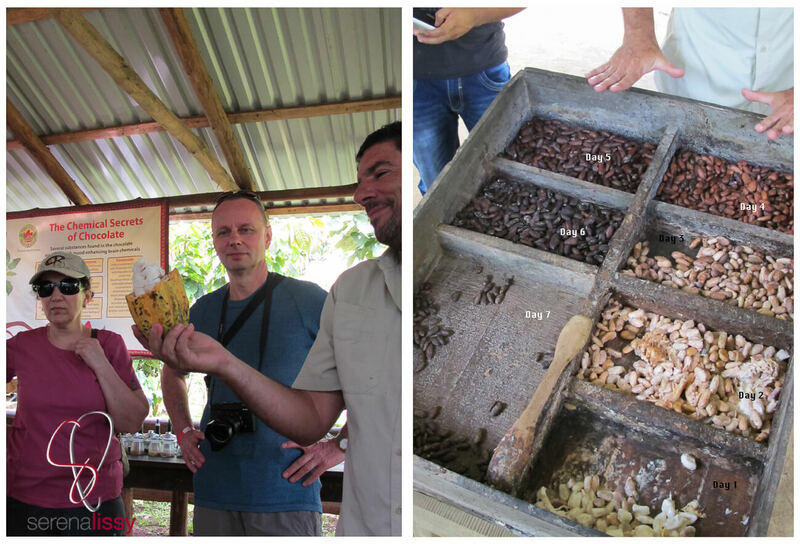 On this tour, we were able to see the plants, the fermentation process, and a small bit of the drying and roasting. Then for our needs they ground it up and made it into a delicious cocoa powder that we mixed with hot water and created our own add ins for flavors. 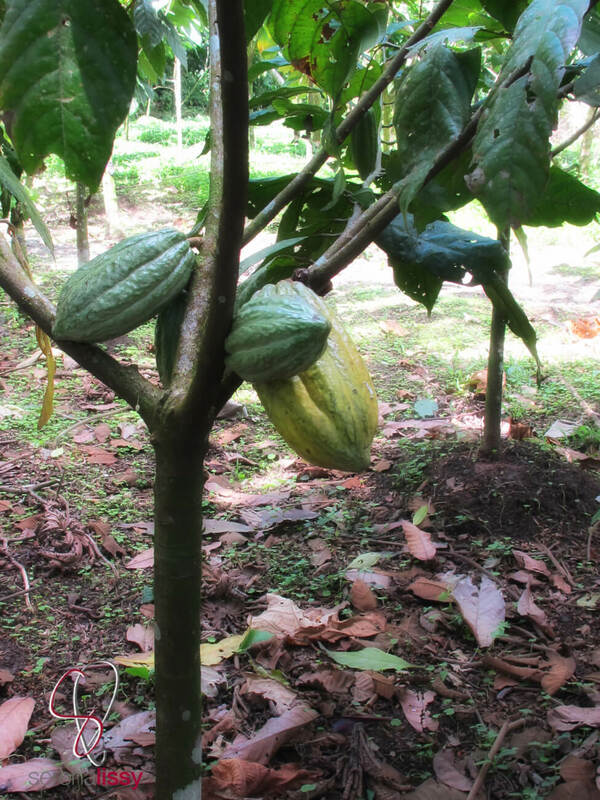 The cocoa plants they try to keep small. The reason they do this is that it won’t require ladders to pick the pods off the branches. Most of the plants we saw were around 8′ tall. The pods were about the size of my hand, around 6-7″. Once the pods were picked, they were broken open. You can see that each pod has about 15-20 beans. Each one of these beans are then removed and placed into the fermentation container, where they sit for seven days fermenting. Each section of the fermentation container is for a day. So you can see the process from day one through day seven. After they have completed the fermentation, they then go through the process of drying. This is done outside under the sunshine. 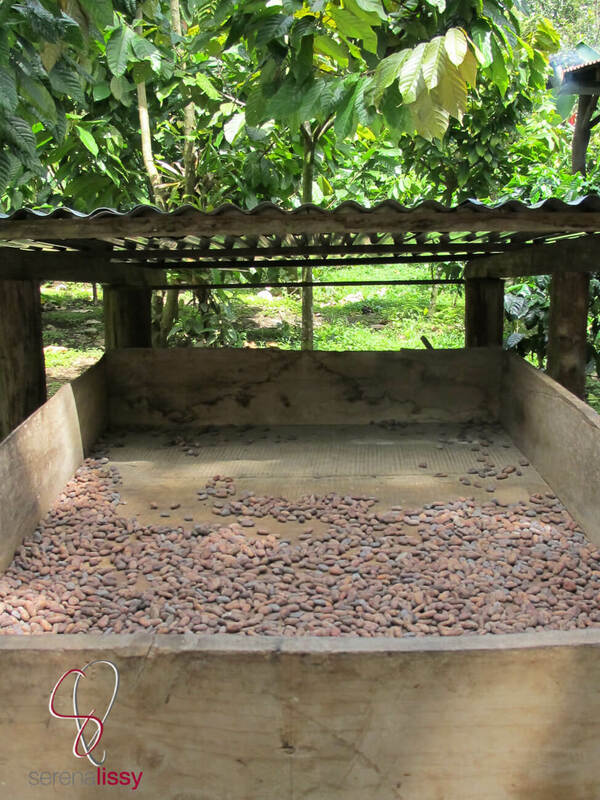 Now once they are dry, is when you really start to see what a cocoa bean looks and smells like. At this time, they had a small stove where they roasted some beans for the tourists to try. Once roasted they are a little softer and you can easily break them with your hand. Once the roasting is completed, here is where the special stuff takes place, also known as the blending of flavors once ground to create any drink you would like. I have no doubt this was everyone’s favorite part. The sky was the limit and it seemed the refills would never stop. When you are in a foreign country always try to take some sort of food tour or cooking class. I do this on every trip I take and I always love it. I learn something new, I get to practice speaking the language, and I see how other cultures do things. Worth every penny.